In Ontario, Canada, on January 6, a day when local trash trucks were coming around to pick up many other families’ discarded Christmas trees, Ukrainian families in Waterloo and Kitchener were busy preparing for the Christmas celebration that was yet to start. 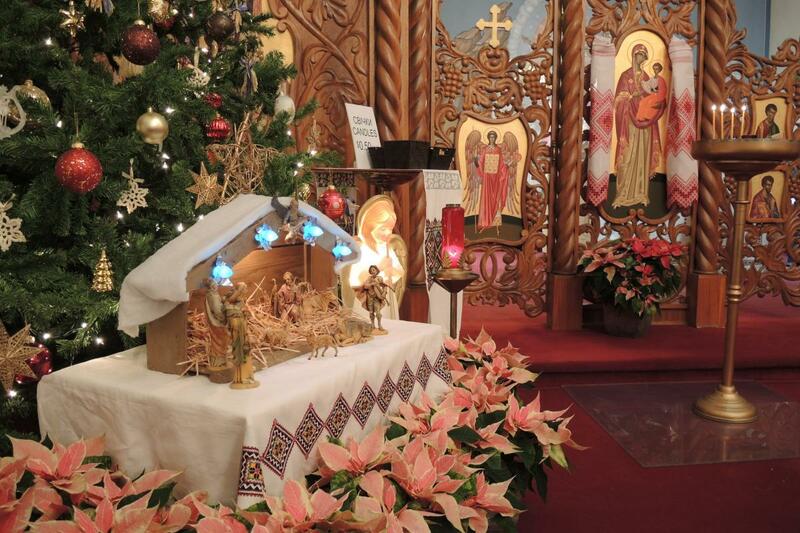 Like Orthodox Christians, Ukrainian Catholics in Canada celebrate the Nativity according to the old Julian calendar.1 Ukrainian Catholics had been observing a fast for 40 days, the Nativity Fast, abstaining from meat, chicken, dairy, many kinds of fish, and eggs. For at least the last several days, even as they observed the Nativity Fast and a full fast most of the day of the 6th, families worked to prepare the foods that traditionally announce the mystery of God-made man. The celebration of the Incarnation traditionally begins at home with a 12-course meal that starts on Christmas Eve, January 6, as soon as the youngest member of the family spots the first star in the evening sky. The meal does not fully break the fast, given that it still a vegetarian meal without meat, eggs, or dairy, but it is a joyous occasion, filled with ritual and symbols, and celebrated with specific foods. Canada is home to the largest Ukrainian diaspora group in the world, 1.25 million Canadians who either emigrated from Ukraine or claim Ukrainian ancestry. They emigrated in a number of waves over the course of the last 125 years, as farmers and laborers, as displaced persons after World War II, and finally in a post-1989 wave of economic migration. Among the earlier immigrants, many faced severe discrimination and worked hard to assimilate, but others found it especially important to pass their language and traditions along to their children. The different layers of immigration add a bit of complexity to the process of remembering a tradition. Some families’ traditions and Christmas songs hearken to pre-World War II ones preserved by their families and churches, while other families arrived with traditions that had evolved, or were slightly different in their Ukrainian context, or had been reinvented or recovered after the fall of the Soviet Union. As with most traditions, it’s not entirely a matter of unchanging, stable traditions that can be reenacted. 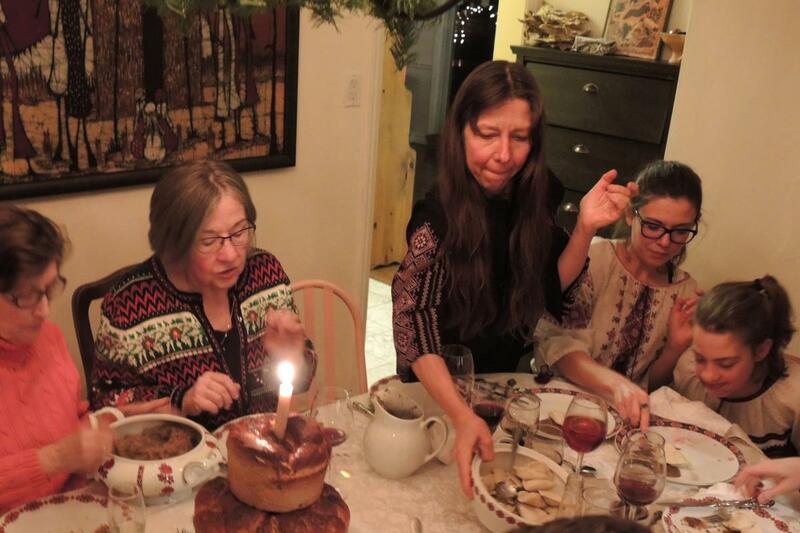 As darkness approached on January 6, a dozen people gathered in the Truchan-Tataryn family home in Waterloo, as many other Ukrainian families were doing at the same time.2 For the better part of a week, Maria, a host of the meal shown in the video here, had worked to prepare various courses for the Sviata Vecherya, or Holy Supper. Her daughters returned home for the occasion, also helping with the meal, and other guests joined their celebration. As it happened, 12 people joined the dinner — friends and family, Ukrainian and Latin Catholic. Maria recounted that this meal was a hugely important event during her childhood, when her widowed mother struggled to support her children, but always made this event memorable. To this day, it is an occasion Maria would never consider skipping. She cooks by memory, without written recipes, but recipes similar to the food she cooked are posted by the Archeparchy of Winnipeg. The meal, which begins with a prayer, traditionally led by the elder male in the household, is ritualized in a number of ways, full of symbols that highlight its religious purpose or simply link it to pre-Christian peasant traditions. 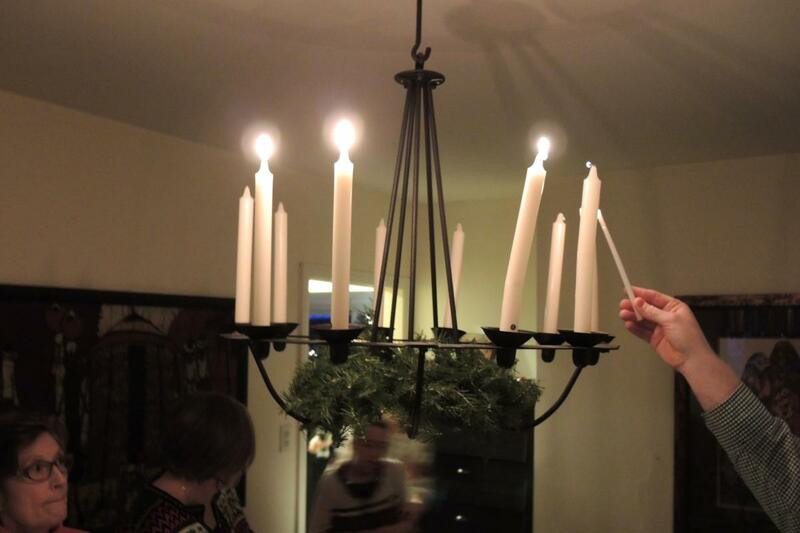 A candle in the window invites strangers and those without others to celebrate with to come in. 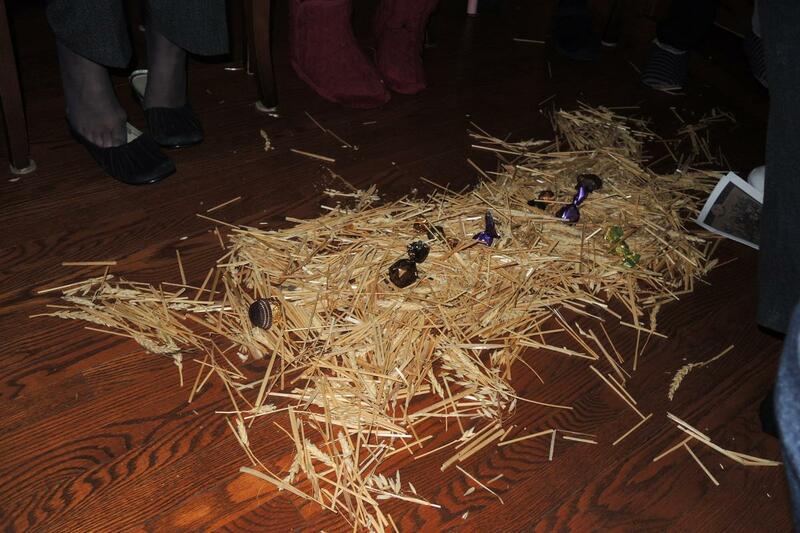 Hay on is spread on the floor and under the tablecloth, to remind us of that God came into the world in a manger. Waiting for the first star, reminiscent of the star of Bethlehem, is another Christian symbol, as the choice of 12 courses, for the apostles, is sometimes said to be.3 The traditional symbols that are not specifically tied to the Nativity story emphasize respect for ancestors and the prosperity of the family. In a corner of the room is a didukh, a sometimes elaborately braided sheaf of wheat, recalling the family’s ancestors (the word derives from the word for grandfather), and serves as a sign of hope for a good harvest to come. An extra place setting at the table recalls ancestors no longer present, and is also a place for the stranger who comes in. Garlic around the didukh serves to ward off evil. 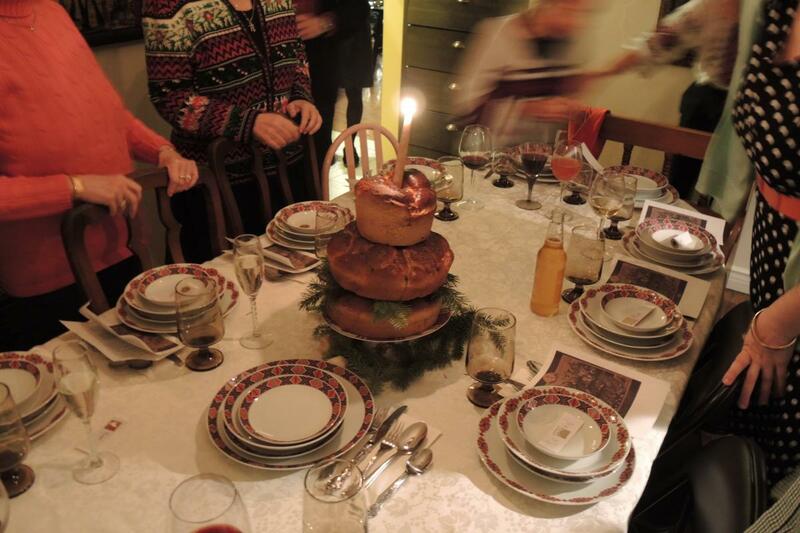 At the center of the table are three braided loaves of kolach, Christmas bread, layered in three tiers, with a lit candle sticking out the top. This bread is not consumed at the meal. The first course is kutya, boiled wheat berries mixed with poppy seeds and honey, and uzvar, stewed fruits. One of the most surprising traditions, one not kept in all households, but which all are at least aware of, is that the man of the house flips a spoonful of kutya at the ceiling. If it sticks to the ceiling, it is a sign of a good harvest to come, and prosperity. As the meal continues, it includes borshch, the Ukrainian beet soup; vushka, mushroom-filled dumplings; other varieties of dumplings; boiled cabbage; stuffed cabbage; and pickled herring, or similar fish. Not all families celebrate 12 courses. Some at church that night said they thought they’d had at least 6 courses. Some more assimilated Ukrainians had not kept it up as a tradition, but in some cases wanted to recover it. After 9 p.m., on an unusually cold night, parishioners from the Kitchener and Waterloo area began arriving at the Church of the Transfiguration, in Kitchener, to mark the Nativity. At 9:30, the choir and pastor, Fr. Tataryn, led the singing of the Great Compline, and people continued to pour in before the 10 p.m. liturgy, the Divine Liturgy of the Feast of the Nativity. The liturgy would be celebrated again the next morning, but the night Mass was the time when most people went if they could. The church, a simple brick structure on the outside, was built by 30 families in the 1920s and seats about 120. A new iconostasis was added in the 1980s, along with icons on the side walls. Almost all the congregation was of Ukrainian heritage, though some had spouses who were of other ethnic heritages. Many, but not all, spoke Ukrainian. 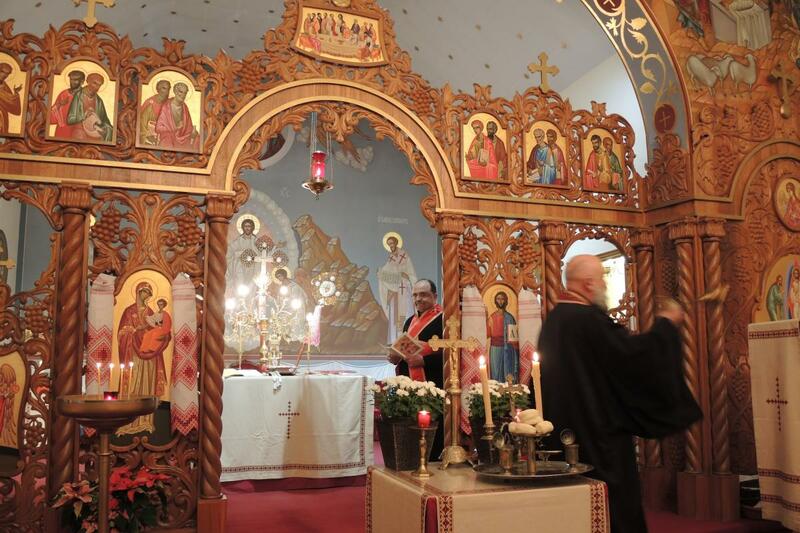 The compline service and the sermon switched between Ukrainian and English, but the sacred liturgy was in Ukrainian. 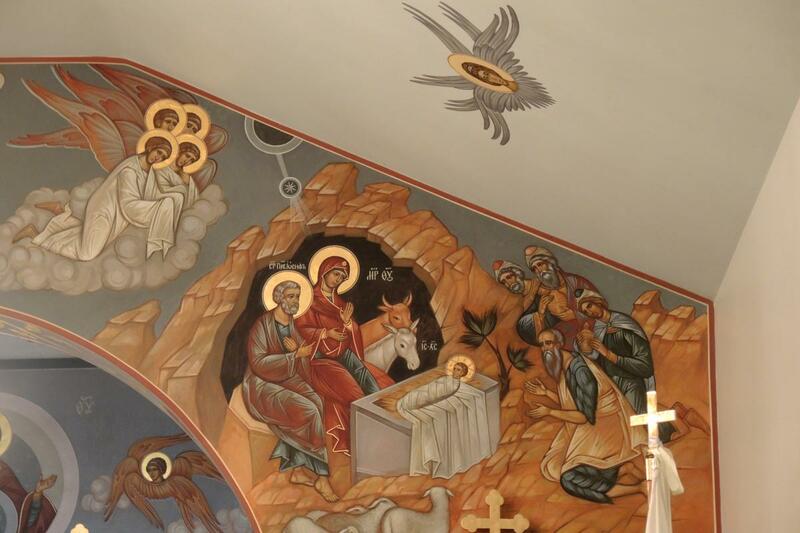 Icons of the nativity are probably the best way of visually capturing the meaning of Christmas, but other symbols, like Christmas trees and Nativity crèches are a typical part of Ukrainian Catholic practice. 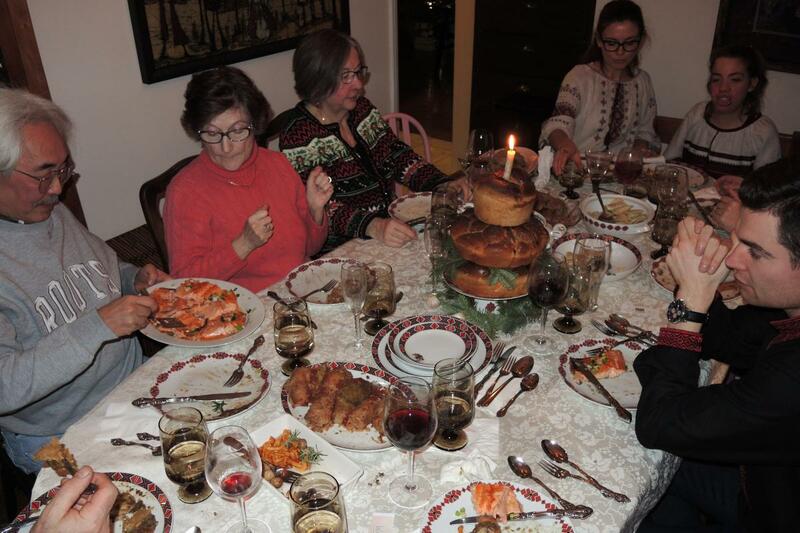 Ukrainian-Canadian families who observe the Nativity on January 7 sometimes come together for a special dinner on December 25 but treat it as a cultural holiday, not the religious one. Ukrainian Catholic churches in some places, including the United States, celebrate on December 25 by choice. In Canada, others have simply assimilated on their own, celebrating on December 25 in Western fashion: “The pull of Santa-ized secular Christmas, with lots of presents, is pretty strong for many people,” one person noted. For traditionally observant families, though, Santa is not part of the practice, and people are purposeful about keeping him out. The Tataryns did so by telling their children that Santa was a helper to St. Nicholas for non-Ukrainian children. St. Nicholas, in non-Santa form, is the traditional gift-giver time for Ukrainian Catholic children. His feast, and the day for gift-giving, is December 19 for Ukrainian Catholics observing the Julian calendar, and December 6 in the Gregorian calendar. It is a day of relief from the Lenten Fast. Christmas season for Ukrainian Catholics runs until February 15, the Feast of the Presentation. One great feast of the Christmas season is January 19, when Ukrainian Catholics, like many Orthodox and Eastern Catholics, celebrate the Feast of Theophany, sometimes simply called “Jordan,” with the Blessing of the Waters, to memorialize Christ’s baptism in the River Jordan. The ritual uses oil, salt, and three candles plunged into water. 1. Ukrainians in the United States often celebrate Christmas according to the Gregorian Calendar, December 25, and there are discussions in the Church in Canada and Ukraine about adopting the Gregorian date, which would have implications for the whole liturgical year. 2. Special thanks to Fr. Myroslaw Tataryn, Maria Truchan-Tataryn, and their three daughters, Aleksandra, Anastasia, and Myroslawa, for their kind hospitality during their Christmas celebrations, and for their explanations of the celebrations. 3. The 12 courses probably derived originally from the months of the year, but came to recall the 12 apostles.